In the age of instant gratification, brand loyalty is not what it used to be: Today, you can get your groceries delivered straight to your home, request a ride across town via Uber or Lyft, and turn to a service like Amazon Prime to bring nearly anything else you want to your doorstep. Indeed, our culture has grow so accustomed to relying on technology for just about anything that many people are quick to jump ship and move on to the next trendy app or service if it promises better convenience and service. While customers stand to benefit due to strategies developed by such forward-thinking companies, this proverbial arms race is causing brands to completely reconsider how to craft messaging and marketing initiatives. Business strategy experts at Accenture recently conducted a study on this very subject in order to identify the latest strategies to reach customers in our digital age. Here are the five loyalty languages that Accenture experts found to be the most effective at establishing brand loyalty. Customers value companies that can custom-tailor the shopping experience for them. Whether it’s deciding between a pair of custom-designed Vans or Nike sneakers or a monogrammed handbag from Madewell or Longchamp, customers appreciate the option to make a product their own — and this appreciation tends to yield brand loyalty. Customers also value brands that communicate with them through their preferred social media channels. This is why it’s so crucial to use a broad range of social media and marketing initiatives to get your message to your customers in a manner that establishes convenience and loyalty. If your company struggles to manage effective customer service, consider using a cloud contact center that offers workforce management software. This can help your company to stay in contact with customers 24/7 — from virtually any location — to better track their wants and needs. Accenture’s research noted that nearly 60 percent of consumers feel loyal to brands as a result of being offered rewards for their patronage. Receiving free gift cards and promotional discounts with a purchase are strategies that have proven effective for creating brand loyalty. While you may view these rewards as an expensive undertaking, it’s actually a short-sighted way of looking at the issue. Instead of focusing on the cost of offering rewards, think of how much more business you’ll enjoy over time by sending small tokens of appreciation to customers when they least expect it. Millennials in particular value new experiences over “things.” To effectively reach this market, you can invite customers to co-create with your brand as well as assist and inspire the design of your products and services. By eliciting customer feedback and putting it into action, you can build loyalty by showing customers that their opinions matter to you. Today’s consumers also appreciate companies that aim to model the same behavior and charisma made popular in pop culture. One highly effective way to build brand loyalty is to partner with social media influencers and celebrities who your audience idolizes. An estimated 23 percent of survey respondents in Accenture’s research noted that they tend to remain loyal to brands that partner with celebrities and social media influencers. Finally, trying to operate in a silo — and not always thinking outside the box — could be a detriment to your business. Partnering with other non-competing brands that attract a similar customer base is a great way to reach new consumers. It’s also a show of good faith to your current customers to connect them with other useful products and services that can make their lives a little easier. Salesforce’s $2.8 billion acquisition of Demandware will serve as the company’s Commerce Cloud. Demandware and Salesforce have a series of joint customers. This acquisition will enable more e-commerce for Salesforce along with Salesforce’s customer relationship management tools. CEO’a are realizing the value of platforms vs. point solutions and the trend is going towards the vendors creating more holistic platforms that offer a continuous marketing, sales, service process. In truth, only companies separate those aspects of their companies into different departments. But customers don’t see a company as separate departments. So the departments really need to act as a whole and software as a platform can be the key to that. The acquisition will grow the sales “funnel” for Salesforce. There is the possibility to expand the relationship with existing customers. So it gives Salesforce a new group of customers to upsell for the other services that it already offered, from marketing and online analytics through to back-office software for sales and other IT functions. Who is Demandware working with now? Some customers include Design Within Reach, Lands’ End, L’Oreal and Marks & Spencer. With more and more people buying on their phone and online, commerce and e-commerce is more and more important. This is a smart move by Salesforce. • Should the Chief Marketing Officer Oversee the Whole Customer Experience? • VentureBeat: Should the CMO Run the Whole Customer Experience? • Executive Brief: Can Brands Keep Their Promise? • Marketing Funnels Are Dead, What’s Next? If you are interested in learning about any of these reports or research, a speech or webinar on any of these or related topics, please reach out to me here! I’m judging the 2016 Constellation SuperNova Awards! Every year the Constellation SuperNova Awards recognize individuals for their leadership in digital business. Nominate yourself or someone you know before August 8, 2016. • Digital Marketing Transformation – Personalized, data-driven digital marketing. If you are doing something really interesting, make sure to send in your case study! It’s your time to be recognized for your hard work! 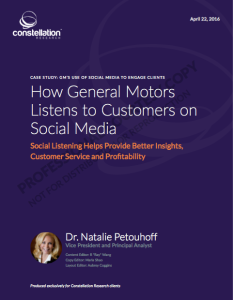 Having worked for GM years ago and lived in Detroit, the motor capital, it was really interesting to see how GM is using social media to listen and engage customers – in marketing as well as customer service. This new case study shows the depth and strength of how GM is taking advantage of what social media can provide to the business. What’s interesting – and if you follow me, you know I am an ROI gal – is that GM was able to trace their social interactions to actual car sales. And that’s really where the rubber meets the road. Social media has huge implications to business – many of them not obvious to many – but over the years I’ve spent a lot of time understanding how social media provides business value. For more information on this report, you can find it here. For other reports on ROI of online communities, ROI of customer care, ROI of agile customer service, Nine Pillars of Successful Digital Customer Experience and Self-service, How General Motors Listens to Customers on Social Media, you can find more info to help your business understand why it’s important to take social and digital media very serious. Covering customer-facing applications that deliver amazing customer experiences. What’s Happening in the World of Shopping and Customer Experiences? At the National Retail Federation Annual Convention in New York City, Microsoft made announcements with GameStop, Hardee’s, TGI Fridays, Panasonic, HP and FreedomPay, and NCR on efforts to modernize shopping experiences. How Does IoT, The Cloud and Customer Experience Come Together? Microsoft believes this will be the year when modern shopping experiences come to life. Where retailers create instant, personalized experiences for shoppers on their smartphone, online and in stores. It will be the year that customers return to stores because technology is engaging them in new ways, making them want to buy more and come back. Microsoft shared for the first time several retail innovations using its technology, including a smart shelf and a tablet-enabled shopping cart, and showed how retailers can gather better store analytics. Microsoft also announced how Pandora and Ashley Furniture are working with technology to create more engaging experiences for employees, helping them be more collaborative and support faster product innovation. Engaging Customers During the Shopping Experience is Essential for Today’s Retailers. GameStop announced it is working with Microsoft to create an interactive, informative and entertaining shopping experience in an immersive environment. In the near future, when customers walk into one of the GameStop pilot stores, they will be connected to the services enabled by the Microsoft Cloud, allowing them to browse product choices, share their shopping cart with salesperson’s tablet running an assisted selling application, and even browse products interactively on a big screen Ultra High Definition TV where they can view video game trailers with pristine clarity. When a customer downloads and opts into the GameStop app on their smartphone, they will be able to interact in a whole new way with GameStop marketplace through the use of Azure. Ultimately, the customer and the salesperson can push the desired products to the point of sale (POS) system for order processing and payment. What’s Another Great Example of How Microsoft is Working With Retailers to Improve Customer Engagement and Customer Experience? One example is Hardee’s new way to make ordering a meal fast and fun. Hardee’s is currently deploying self-ordering kiosks for ordering meals, using Windows 8 devices. These in-store kiosks are being tested currently in 30 restaurants with plans to extend that test to additional restaurants soon. Each kiosk allows customers to review the menu and order food and lets managers run sales and shift reports, while dramatically reducing wait times. Check out the video and read more here. Another Example is TGI Fridays Who Has Plans to Transform the Way People Order Food by Equipping Servers with 8-inch Tablets Armed with Payment Sleeves. With the Fridays’ Service Style technology the customer’s order is processed right at the table, the device also helps manage the waiting list and queue. The solution helps ensure orders are correct, reduces training time, and streamlines waitlists. Modern Points of Sale Connect Retailers and Customers in New Ways. As the shopping experience becomes more modern, so does the POS. Modern POS devices are allowing retailers to better understand their customers, provide more customized service, and help them achieve compliance with new security measures being implemented in 2015. In partnership with Panasonic, HP and FreedomPay Microsoft is demonstrating how the modern POS can create personalized retail experiences, in real-time, through smart and secure devices. With new security regulations on the horizon, retailers need to upgrade their POS devices, not only to ensure their customer data is safe, but to also be able to provide a more personalized and seamless experience at check-out. Read more about modern POS devices here. Innovation that helps retailers understand buying behavior and customers make informed decisions. One of the challenges in retail is to create an in-store experience that engages customers in unique ways, entices them to come in to stores, and keep them coming back. Creating those connections creates better experiences and ultimately increases sales. With the help of a Kinect sensor, AVAretail’s SmartShelf technology allows every interaction of a shelf in a store to be monitored and recorded in real-time, providing insight into which products are most selected and picked up by customers. Another form of technology, Path Tracker, gives retailers real-time detection and analysis of a customer’s shopping path. This provides counts of people in the store, areas visited, dwell time and shopping path, acting as a heat map of where customers are spending the most time in the store. The NEC Biometric interface with Kinect Camera System Provides Demographic and Face Recognition Services to a Kinectically Enabled Application. Retailers can use this information for analysis and for providing the customer with a more personal selling experience. MediaCart will change the shopping cart as we know it. Adding a location-aware tablet to the cart allows a retailer to present a personal and relevant shopping experience to its customer. This allows context sensitive ads and promotions when in front of various products along with a barcode scanning capability for price lookups and basket totals. Retailers Are Predicting Consumer Behavior With Machine Learning. As technology advances, consumers have more tools at their disposal during the buying process. This trend seems to be growing exponentially, especially as the Internet of Things (IoT) matures. This is both an opportunity and a challenge for retailers looking to capitalize on a whole new base of consumers. Competitive pressure, combined with ubiquitous connectivity, smart devices and an intelligent cloud platform is causing a shift to a new retail reality. Food delivery company JJ Food Service uses machine learning to make product recommendations as customers are shopping for food. This provides insights, saves on costs, and ensures their customers have the food they need, when they need it. Customer Behavior Can Be Predicted. Auckland, New Zealand-based VMob runs a mobile engagement platform on Microsoft Azure which predicts likely customer behavior based on historic and live data streams. The platform currently delivers personalized content to millions of consumers around the world, including customers of McDonald’s across several European markets. The VMob platform collects real time data from multiple sources including mobile devices, wearables, location temperature sensors, WiFi transmitters, beacons, digital signage, and POS systems to personalize engagement with the customer. The VMob platform uses Azure Machine Learning to harness the Internet of Things to predict future customer behavior – transforming live and historical data streams into actionable insights McDonald’s can employ to individualize its marketing efforts. See more information about VMob’s work here. You Want to Reach Your Customers Where They Are. For retailers to succeed, they need to reach their customers where they are. Because of this, we are pleased to be announcing Sitecore Commerce, powered by Microsoft Dynamics. This solution integrates the experience management capabilities of the Sitecore Experience Platform with the omni-channel commerce capabilities of Microsoft Dynamics AX for Retail. The result is a product that allows enterprises to bridge the gap between in-store and digital experiences. We are also announcing a combined effort with Toshiba to form the Toshiba Global Commerce Solutions with Microsoft Dynamics to help retailers deliver leading customer experiences through true omni-channel customer engagements. This effort includes Toshiba delivering software and implementation services on the Dynamics platform as well as plans for the global availability of a combined solution – TCxGravity powered by Microsoft Dynamics – specifically tailored to deliver omni-channel transformation on the customer’s terms, helping it provide seamless brand experiences to build lasting loyalty. What’s The Future of Retail? Retailers are changing the game through connected stores, empowered employees, digital engagement and ambient intelligence all geared toward delighting the modern shopper. By gathering and ingesting insight from myriad data sources, retailers can create a comprehensive understanding of each customer, its store’s inventory and the capabilities of its business to seamlessly match people with the products and services they desire. The end result of these technologies and services, and of Microsoft’s work with retailers, is an increased focus on solutions that help grow sales and profits, increase customer satisfaction and loyalty, bring products to market faster, and create a more effective business. If you want more information, visit the Retail Newsroom, The Windows for Your Business Blog, and The Dynamics Blog. MyPOV: I Love to shop and I love technology. So this is gonna be a great year! I can’t wait to see how cloud computing, IoT and customer experience emerge as the top competitive advantage to lead conversion rates, higher revenues and awesome customer experiences! Doing Something Really Interesting in IOT Customer Experience or Cloud Customer Service? Apply for a SuperNova Award! We will be recognizing nine individuals who demonstrate true leadership in digital business through their application of new and emerging technologies. We’re searching for leaders and teams who used disruptive technolgies to transform their organizations. Special recognition will be given to projects that seek to redefine how the enterprise uses technology on a large scale. What’s the Timeline look like? I kinda hate to publish this, because everyone looks at it and thinks- Oh August – I have plenty of time! Don’t kid yourself. It takes time to not only do a great project but also document it! So don’t wait to the last minute… If you are up to something special, start jotting down your project info so you won’t be late with application submission!!! And make sure you have data to show your results! February 8, 2016 application process begins. August 8, 2016 last day for submissions. September 7, 2016 finalists announced and invited to Connected Enterprise. Wondering Who Are the Judges? The judges are technology thought leaders, analysts, and journalists selected for their futurist mindset and ability to separate substance from hype. The SuperNova Award Judges carefully evaluate each SuperNova Award application against a rigorous set of criteria. Judges will identify individuals who demonstrate true leadership in the application and adoption of new and emerging technologies. Want to catch a judge’s eye? Judges look for projects whose elements can be replicated in other enterprises. Want to know more about the awards and judges? You can learn more about the SuperNova Award Judges. Digital Marketing Transformation – Personalized, data-driven digital marketing. Who Won Last Year? I knew you would ask that, so here’s that info below. And they were all outstanding. Let’s see if you can beat what they did last year! We are really looking for the super stars. And you know who you are! Naveen Gunti: Senior Director of e-Commerce Technology and Operations, Tumi Holdings, Inc. So there’s your bar. It’s been set high, but I know you can top it! Go for it! Can’t wait to see you at SuperNova Awards Gala Dinner at Connected Enterprise!! In this research, we look at trends to take ordinary experiences and deliver superb experiences that keep brand promises by delivering superb customer experience management across the web, mobile and commerce. Clients should use this document as a source for planning and work closely with both the business and technical teams to ensure success to deliver on the brand’s promise. 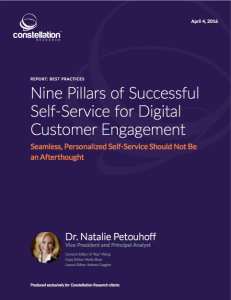 This report offers insights into four of Constellation’s primary business research themes, Next-Generation Customer Experience, Digital Marketing Transformation, Matrix Commerce and Data to Decisions. The shift to digital marketing and commerce as well as mobile interactions brings a massive transformation to how brands and organizations engage prospects and customers. Customer experience management is a major pillar in many organization’s efforts to engage and retain their customers and partners. Customers, depending on the vertical market, might be patients (healthcare industry), members (financial services industry) or students (higher education). 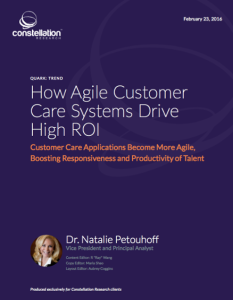 Organizations are realizing there is more to the job of engaging and retaining these customers because there are so many opportunities along the customer experience journey to have something “fall through the cracks” and not meet expectations. Market leaders realize the future requires proactive digital enablement of the business to support the future strategy of their organizations. Constellation has identified key attributes required for success at experience management and using them, leaders can expect to have a basic blueprint to embark on this key strategic initiative. For more information on this report, you can find a snapshot here. Unfortunately, in almost every segment, Constellation estimates that the top three competitors control from 43 percent to 71 percent of market share and 53 percent to 77 percent of the profits. In the technology space, only 80 companies since 2000 have made the billionaire’s club in annual revenue. Meanwhile, intense competition, short-term shareholder and management thinking, and minimal investment hamper the pace of investment and innovation required by business leaders to survive today’s competitive landscape. While many brands have not been complacent about addressing change, the past five years have shown the difference between those who invested in digital transformation and those who have not. The corporate digital chasm is massive among market leaders/fast followers and everyone else. Astute brands realize they must invest in transformational change or face a vicious Digital Darwinism. Is your brand ready for digital disruption or are they a “wait and see” brand”? 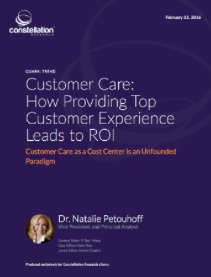 We just finished some new research that shows the correlation to customer experience and commerce / revenue. Below are some of the highlights of the research and a link to a snapshot of the paper is here. Stat: Only 52 percent of U.S. and 53 percent of U.K. brands were very effective in knowing who their most profitable customers are. This means that nearly half of their time is spent with the wrong customers (low value) or, if they are spending time with the right customers, the customer experience does not provide a high conversion rate. Thus, brands require a new approach. 2. Know where (which channels) their high value customers are coming from. Stat: Only 58 percent of U.S. and 48 percent of U.K. brands were very effective in knowing where (which channels) their high value customers are coming from. In this context, channels include social media, websites, search engines, etc. Basically, brands are guessing at where to spend their marketing and ad dollars to provide the highest return on investment. 3. Know which high value products customers are interested in. Stat: Only 59 percent of U.S. and 56 percent of U.K. brands were very effective in knowing which products customer are most interested in. Consequently, brands may not be displaying the best products to the highest value customers, thus losing revenue and profits. 4. Know which high value products customers have viewed. Stat: Only 60 percent of U.S. and 56 percent of U.K. brands were very effective in knowing which products customer have actually viewed. When brands understand the customer’s journey, they can direct their spending and messaging to the moments of maximum influence. When they do this, they will have a much greater chance of reaching customers in the right place at the right time with the right message, producing higher conversion rates. How does your company stack-up compared to these companies? What have you done to improve your customer experience so that it results in better revenue and customer experiences? First there was e-commerce. Amazon and eBay led the way. This has been followed by thousands of retailers, from Kmart to Delta to 1-800-Flowers to Home Depot, selling billions of dollars of merchandize each year on websites. In those models, an individual company has to promote its e-commerce platform to get people there to buy. According to audience measurement and tracking firm comScore, currently U.S. retail e-commerce spending went up 14 percent Online retail spending reached $37.5 billion, primarily due to an increase in the number of buyers (up 16 percent), with 70 percent of all Internet users making at least one online purchase. comScore chairman Gian Fulgoni states that almost $1 in every $10 of discretionary spending in the U.S. now occurs online. But what if a company tapped into the communities where their customers were already on and offered them the same things there? Social Commerce does just that. Simply stated, it is e-commerce on social networking sites. A half-dozen reviews from people you don’t know? A coupon for 10 percent off a product for your first visit to the site? Recommendations of twenty of your best friends that bought, use, and love the same product? Social networking sites are allowing brands to use plug-ins and widgets to connect and encourage customers’ friends to comment, displaying visible discussion threads, thereby creating social shopping experiences that are fueled by word-of-mouth marketing. While e-review sites have driven e-commerce (or prevented it if there are a lot of negative comments about a product or service), the idea of having people you know comment and recommend products they like is the premise of Facebook commerce, also known as f-commerce. With over 750 million active users on Facebook, there are more potential customers using Facebook than there are logging into eBay and Amazon combined. Some customers may not see Facebook as a purchasing platform yet, but more and more businesses are adding features so customers can browse and/or buy their products on Facebook. 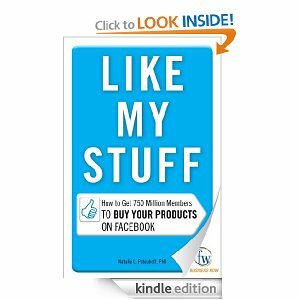 By reading this book you will be at the forefront of a huge movement in social media commerce. This e-book is about how Facebook is transforming into an e-commerce platform. It is written to help you understand what f-commerce means to business owners, large and small. It includes practical examples of brands that have deployed Facebook e-commerce and how you can use f-commerce in your business. You can order my e-book by clicking here. What Is Social Commerce? eBay Takes a Stab With Its New Site Redesign. Calling #ServiceTrailblazers For Dreamforce 2018! Protected: Calling #ServiceTrailblazers For Dreamforce ! What’s One of the Best Ways To Reach Your Audience to Avoid “Content Shock”? 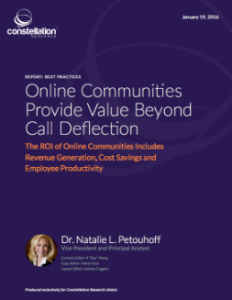 Dr. Natalie is a business strategist and a futurist. She has spent her careers looking about how businesses interact with their customers and their employees and she provides companies with the best way to create environments that foster loyatly, motivation and innovation.